Faust International Youth Theatre welcomes you to join our new Page to Stage Storytellers Programme! Page to Stage has been specially designed to bring to life much loved stories for your kindergarten students! In a fun and immersive setting out qualified drama facilitators will explore the story, setting and themes and introduce students to characters using interactive role play. 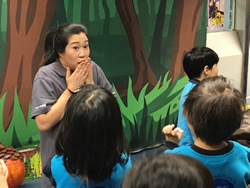 Using the imagination skillset of your students we will journey through the story and develop the acting tools of physicalisation, body language, facial expression and vocal emotion. 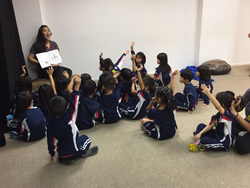 Each story telling session is 30 minutes and is priced at HK$3,000 per session. Additional discounts for larger bookings are available. Some stories we have covered include: We’re Going on a Bear Hunt, The Gruffalo, Stickman, Where the Wild Things are, Walking in the Jungle, and many more are also available! Storytelling sessions can be delivered at schools or in our Black Box theatre venue. To bring one of these stories to life or for information on how to create your own unique Page to Stage experience, email TouringTheatre@FaustWorld.com.